From Facbook, Instagram, Whatsapp, Twitter etc. to all the social media sites, these days video of a girl is trending everywhere. Nobody knows how it all started. Even our 'sakht launda' Zakir Khan requested not to click on her memes or any of her photo and remain 'sakht'. It has became a national issue and due to presence of social media it went viral everywhere. Let's know about her a little and then we will figure out how it all started. Her name is Priya Varrier and she is just 18 years old and a first year B.Com. student at Vimala College Thrissur. The video in which she is performing is a Malayalam song Manikya Malaraya Poovi from the movie 'Oru adaar love'. She is being searched everywhere and now she and her song is a National Sensation. 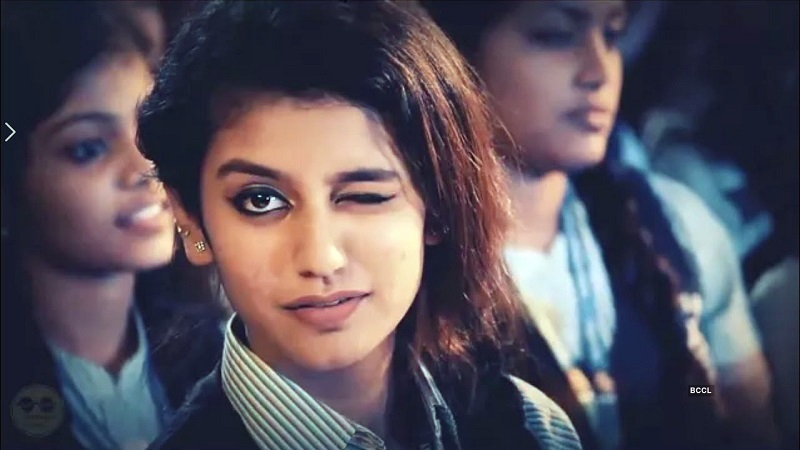 The way she winked and smiled has already stolen hearts of million Indians. Some of us say they didn't got affected and remained "sakht" while others were already melted by the beauty of this girl. If this continues this way, the day is not far when she will become International sensation and top searched Google keyword. It is easily possible because India has 2nd largest Internet subscribers after China. On her Instagram handle, according to recent update 2 million followers have already been following her. She is one among Dhinchak Pooja, Omprakash Mishra etc. squad, who gained surprise popularity. Our meme makers already started targeting her with famous personalities like Narendra Modi, Radhul Gandhi etc. While on the other hand, AIB (All India Bakchod) is organizing an event on 14th Feb 2018 about "Pyaar Mohabaat Ek Dokha Hai" and it already started its awareness campaign to stay away from such baits. The way our social media is used by public is just strange. Anyone can be made an overnight celebrity. She's one of those lucky people who became famous for none of the reasons. Apart from the beauty, she has a nice voice too. She already uploaded a song Channa Mereya from bollywood. It will be interesting to see till when she will remain celebrity because people have already made and forgotten many of youtube sensations.